As the Runnin’ Utes basketball season gets underway, a lot of changes are afoot, both for me personally as well as the basketball team as a whole. For the past few years, my teenage son Josh and I battled to sit on the front row in the Huntsman Center, or as near to the front row as we could get. Because our section was unassigned-seating, available on a first come, first served basis, we had to be there when the gates opened. Often we arrived well before the appointed time so we would be first in line. Actually, I misspoke above – we rarely sat down, but rather we would stand throughout the entire game cheering on the Utes, yelling at the refs (me more than Josh) and generally having a whale of a time. It really is a lot of fun to trash talk to opposing players when they can actually hear you. Many of them would even talk back and carry on a dialogue with me throughout the game. To top it all off, we each put together outrageous outfits to wear. 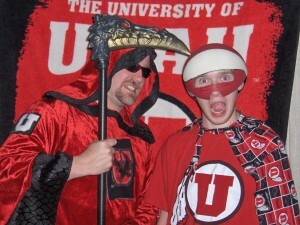 I had a grim reaper outfit in crimson red trimmed with black, with Utah logos plastered all over it. 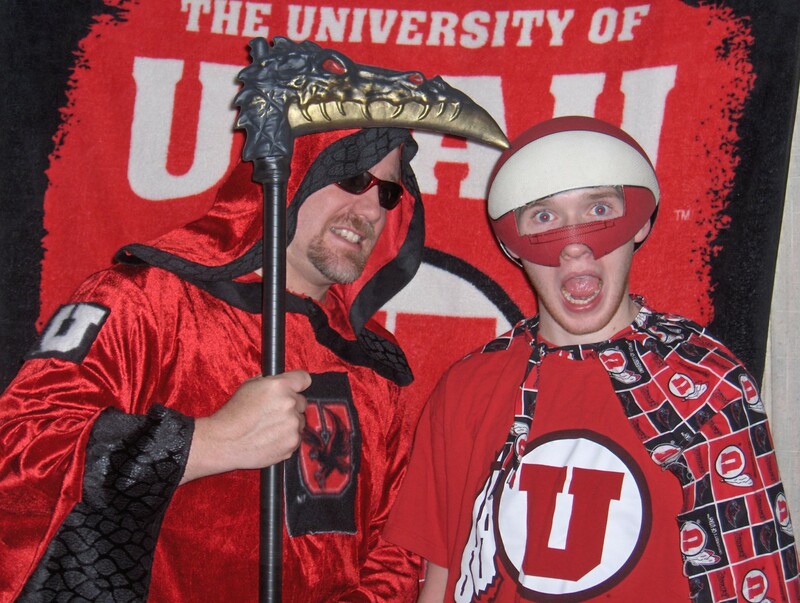 At first, Josh started off with a superhero theme with a basketball head and Utah logo cape. Eventually, Josh’s outfit evolved into somewhat of a warrior theme with flaming red hair similar to Heat Miser, a black mask with crimson designs, and a red-flowered lava lava. We each wore hand-painted crimson, white and black kukui nut necklaces to complete our outfits. I have always enjoyed going to Utah basketball games. However, I have never enjoyed it more than when my best friend was by my side, acting as crazy as me. The past few years when the Utes themselves haven’t given the fans much to cheer about, just having my son by my side made the effort worth it. This year has been quite an adjustment for me. Josh is now serving as a full-time missionary for the Church of Jesus Christ of Latter-day Saints in the Micronesia Guam Mission. Suffice it to say, Josh currently has far better things to do than go to a basketball game with me. I still go to the Utah basketball games, but it just isn’t the same. I toyed with the idea of going solo in costume, but ultimately could not find the heart and will to do it on my own. Instead, I have retreated to a seat still in the lower bowl but well behind the visiting bench next to one of my old cronies, Richard Mecham. Ironically, I have taken the seat that used to be filled by his brother, Steve Mecham, who is currently serving as the Mission President in the Micronesia Guam Mission – is that karma or what? My change of circumstances has left me somewhat melancholy. Fortunately, that has been offset by the Runnin’ Utes’ change in fortunes on the floor. Sometimes a little bit of change will do you good. A lot of change for the Utes has made a tremendous difference. Notably, while Jim Boylen’s teams had a tough time winning, they did not necessarily lack talent. Many of these players now play elsewhere. Will Clyburn leads Iowa State in scoring. J.J. O’Brien is a significant contributor for San Diego State, which is 18th in the AP Poll and 15th in the Coaches Poll. Marshall Henderson led South Plains College to the junior college national championship with a perfect record while earning National Junior College Player of the Year honors and now plays for Ole Miss. None of the players mentioned above stuck around when Boylen left and the keys were handed to Larry Krystkowiak. Krystkowiak did his best to cobble together a team at the last minute for last season. This year’s team is a glimpse of what Krystkowiak can bring to the table when given a chance. There are only a handful of players left from last year’s squad. David Foster injured his foot again before the season ever began and his career as a Ute is over. Jason Washburn and Cedric Martin are the only returning starters. Alex Mortensen is also back, but rarely sees the floor as many newcomers have earned minutes due to their outstanding play. Immediate impact players include true freshman Jordan Loveridge, a 6-foot-6 forward out of West Jordan and sophomore Dallin Bachynski, a seven-foot center from Calgary, Canada. While Bachynski only returned home from serving as a full-time missionary for the LDS Church a few months ago, he has already stolen the starting job from Washburn. Forget potential, this team is actually producing, and exceeded last year’s six wins by garnering win number seven in just the ninth game of this year with a blowout win over Boise State (who had previously beaten then-10th ranked Creighton). Nevertheless, this team is still a work in progress and the players are still learning how to play with each other. Consequently, the Utes let a W slip through their fingers in Provo last Saturday against BYU. I would love to have another shot at BYU on the hill after the newcomers have had more of a chance to gel together. Perhaps Chris Hill would consider reinstating a home-and-home basketball series with BYU on an annual basis, instead of the home-and-home series that the Utes have with SMU this year. While the Runnin’ Utes may not contend for the Pac-12 title this year, they are going to surprise a lot of teams, and will continue to give their fans something to cheer about. Dwayne Vance is a sports commentator. The opinions stated in this article are his and not representative of St. George News.